We have a super fun card kit for you this month! The new Cooler with You Card Kit will be available Tuesday, October 18 at 10pm EST. I have a sweet and simple card to share with you today. 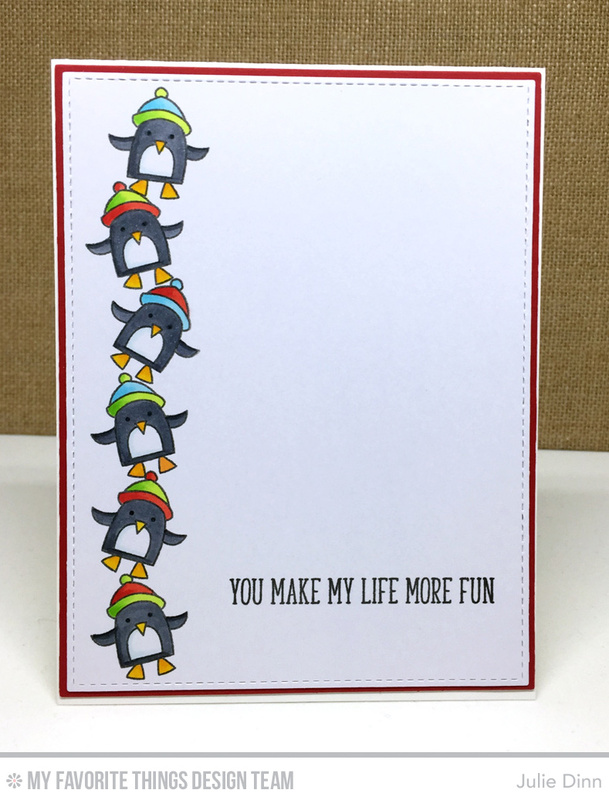 It features one of the smallest stamps in the set, the cute little penguin. I just LOVE penguins and I couldn't wait to ink up this little cutie! I stamped the image along the left hand side of the X-Press It card stock and I coloured it with Copics. I finished off the card with a simple sentiment from the Cooler with You stamp set. Be sure to check out the MFT Blog to see all the gorgeous creations the design team has to share with you today. A cute card Julie and your colouring is amazing. Of course your card would be AMAZING!! It's absolutely adorable!! What a fun card. Love all the color. Julie! I absolutely LOVE this card! The stacked penguins is Pure Genius! How great this looks! Oh my god your card is so gorgeous, really fantastic.♥ Many thanks for your inspiration. Love Love Love...CAS and Beautiful! I love your use of that small penguin stamp! Such a great idea. TFS!